For the NES version, see Section Z (NES). 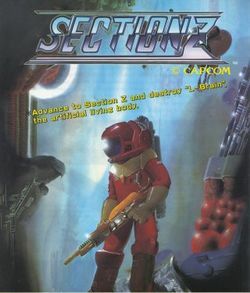 Section Z is a side-scrolling shooter produced by Capcom that was originally released in 1985 as an arcade game. As a sole astronaut, you must penetrate the alien Balangool space craft and destroy the evil "L-Brain". Make your way through 26 alphabet-labeled levels to find his lair. Every few sections (stages), the direction of the game's scrolling changes, from left-to-right, to bottom-to-top, to right-to-left, etc. One section features a pinball machine in which you must avoid the multiple flying pinballs. The only contemporary home conversion of this game was developed for the Family Computer Disk System in Japan and the Nintendo Entertainment System in North America, and was released in 1987. It is considerably different from the arcade release, and therefore has its own guide. In the year 2XXX, the "Balangool" Empire rampages through space at will and invades one planet after another. The evil hands are finally reaching towards the planet earth. You are a lonely astronaut in space. You must penetrate the enemy base which is divided into sections from A to Z and must destroy the "L-Brain" in the final target section Z. Urgent order!! Destroy the secret base of the Balangool empire! Can you carry out this vital mission? This page was last edited on 13 September 2009, at 01:24.